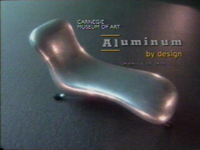 Click on the image displayed at right to view a video tour of Aluminum by Design: Jewelry to Jets exhibit at the Carnegie Museum of Art, Pittsburgh, Pennsylvania. To best experience this presentation, you should employ the latest version of RealPlayer. Production of the Prowler, a car made of aluminum and other materials, began in 1996 and continues now as a result of a partnership between Chrysler Corporation and Alcoa. A Featherweight Blick typewriter made of aluminum, iron, plastic, rubber, copper, and felt. Designed by George Blickensderfer Manufacturing (1894). A ball gown with stole, made of Lurex (aluminum foil coated on both sides with plastic), silk, and mink (1956). As part of the Aluminum by Design: Jewelry to Jets exhibition, the Carnegie Museum of Art will offer complementary programs, publications and activities. A 296-page book, with 250 color illustrations, traces the history of aluminum as a design medium. “Aluminum By Design” distributed internationally by Harry N. Abrans, Inc., is on sale in book stores as well as on the Internet. Alumi-Nuts: Collectors’ Confessions will be displayed in the museum’s Treasure Room through February 11, featuring highlights from eight notable Pennsylvania collections of aluminum decorative and household objects. An “Aluminum by Design” symposium on November 10 and 11 will gather scholars, curators and designers to examine historical issues as well as contemporary design in aluminum. The symposium is free and open to the public. Aluminum in Contemporary Architecture will be on display in the museum’s Forum Gallery from November 18 through February 4, 2001. The exhibition will feature architectural drawings, models, and photographs of nine buildings from around the world that incorporate aluminum in their design. Also, on January 18, the museum will present a tour of the new Alcoa Corporate Center in Pittsburgh. Information on all programs of the Carnegie Museum of Art is available by phone at (412) 622-3131, or at the museum web site, www.cmoa.org. The main gate at Alcoa’s Aluminum Research Laboratories, New Kensington, Pennsylvania (1929). An early exercise machine by Health Developing Apparatus Company, made of aluminum, brass, steel, wood, and cotton rope (1905). A set of aluminum playing cards from the Buffalo Exposition (1901). An Airstream trailer was so light that factory workers could carry it (1965). Titania, an aluminum lamp designed by Alberto Meda and Paolo Rizzatto (1991). Editor’s Note: Photographs reproduced with permission from the Carnegie Museum of Art. Clayton Bailey photographs reproduced with artist’s permission. August Edouard Achille Luce fan photograph reproduced with permission from the National Museum of American History, Smithsonian Institution. Aluminum has sided our houses and contained our beer. Since the 1940s, it has had its place in the everyday landscape of modern living. Although few would deny it is practical and useful, this mass-produced metal can also be viewed as a thing of beauty. Two museums have recently recognized aluminum as an artist’s medium. They vary in scope, but both exhibitions highlight aluminum’s versatility, with uses that range from sculpture to dresses, jewelry to robots. One exhibition, Sheen of Silver, Weight of Air, focused on contemporary aluminum artistry. That exhibit ended in September of this year after a three-month run at the Schneider Museum of Art, Southern Oregon University. Another, Aluminum by Design: Jewelry to Jets, is ongoing at the Carnegie Museum of Art in Pittsburgh, Pennsylvania. That wide-ranging exhibition opened October 28 and continues through February 11, 2001. The exhibit, which includes some 350 items, is the culmination of four years of effort by museum staff, including curator Sarah Nichols. The show covers all facets of aluminum, including its place in architecture, jewelry, the automobile industry, and day-to-day life. See the accompanying video tour of Aluminum by Design: Jewelry to Jets, which can be viewed using the latest version of RealPlayer. The Carnegie exhibit, sponsored by Alcoa Foundation, flows chronologically, tracing the history of aluminum back to its beginning about 150 years ago. Then, before it was mass produced, aluminum was considered a precious metal, rare and expensive. One of the collection’s historical highlights is a table centerpiece, made in Paris in 1858 by Charles Christofle, and presented to Napoleon III. An ornate sculpture, the piece is made of aluminum, silver, and gilded bronze. From the same era is a bracelet of aluminum and gold, designed by Armand Dufat. The metal became less elitist around the turn of the century, following the development of the Hall-Heroult process, which made aluminum more widely available. From that period forward, the exhibit’s collection branches out, just as aluminum’s uses did. “It’s a product that commercially had its birth at the very end of the 19th century,” Nichols said. As the exhibit proceeds forward in time, it looks at efforts to develop aluminum as a commercial material. At first, the focus was on imitation and substitution— finding a way aluminum could imitate other materials. For example, the show displays furniture from the early 1920s that was made of aluminum but painted to look like wood. In pots and pans, it was used as a substitute for copper. What aluminum struggled for at that time, Nichols said, was a “vocabulary” all its own. When that time came, creativity surged. “At the beginning of the 20th century aluminum found its own voice,” she said. That was when the metal began to appear in architecture, lighting, and transportation. In the Carnegie, transportation early in the century is represented with a 1921 aluminum Rolls Royce. Aluminum as a household work-horse is also shown with vacuum cleaners, tea kettles, coffee pots, and the like. Although the household section of the exhibit may bring back memories for visitors, this show is not about nostalgia, Nichols said. “It may be nostalgic for people looking at it, but it was cutting-edge modern when it was first made,” she said of the aluminum products. During the second World War, aluminum production increased dramatically to support the war effort. After the war, aluminum companies struggled to maintain production. To that end, Alcoa developed an “Imagineering” program, encouraging imagination in engineering, and the Carnegie exhibit offers advertisements from 1946 related to that program. Also on display from the post-war effort are a rug and two tables, which were designed to encourage innovative uses of aluminum. New markets were created as the metal seeped into the sports-equipment market in the form of baseball bats, tennis rackets, and bicycles, all on display at the Carnegie. In a section of the exhibit called “material wars,” aluminum’s competition with earlier products, such as glass, wood, and steel are highlighted, as is its struggle to hold its own against plastic. A major factor in those material wars, Nichols said, is aluminum’s ease of recycling. In a look at contemporary uses for aluminum, the exhibit shows off such oddities as a dress of aluminum disks created in the 1960s by designer Paco Rabanne, robots, and the Plymouth Prowler, a car designed by Chrysler in the early 1990s. Boris Bally’s Transit Chairs, made of recycled street signs, have been displayed at aluminum exhibits this year in Pennsylvania and Oregon. Amid the buzz and clatter of machinery, Boris Bally’s art takes shape. His medium: street signs. The Rhode Island metalworker has displayed his “Transit Chairs,” colorful, metal pieces crafted from scrapped street signs, at two art exhibits recently: one in Pittsburgh, Pennsylvania, and the other in Ashland, Oregon. Bally also forms the signs into bowls, a popular gift item. In fact, this is the beginning of his busy season, Bally said, as people place their holiday orders for his work. Helping in his shop on a recent October afternoon were a high school intern, a full-time assistant, and a tenant of Bally’s who exchanges labor, in part, for rent. Street signs have given Bally his artistic direction for about ten years, but he has a history of creating art out of others’ throw-aways, especially aluminum. When he was growing up in Pittsburgh, he shaped metal scrap, for a short time, into numchucks, a martial arts weapon. Local police were none too pleased with that metalworking venture, however. “They made me promise never to make them again,” Bally said. So he began turning out skateboards with tops made of scrap aluminum. Those were a hit with the teens in the neighborhood and did not offend police. About that same time, when he was still a teenager, Bally took a course in jewelry-making at the Pittsburgh Center for the Arts, where his interest in metal working was channeled in a new direction. Soon after high school, Bally went to Basel, Switzerland, where he was trained as a goldsmith. Bally, whose father was an industrial designer with plenty of tools and metals at home, remembers his attraction to the challenge of metal work. “I never realized something so hard, so difficult, so unforgiving could ever be shaped by people,” he said. With its lightness and flexibility, however, aluminum is an easy metal with which to work. The street signs that make up the bulk of Bally’s materials are aluminum, salvaged from scrap yards. Because of their degrees of disrepair, they test his skills. “Some are flat, some are bent, some are dirty, some are clean. It’s so varied, it’s actually a huge challenge,” Bally said. But it is a challenge he enjoys, and that has garnered attention as well as orders for his work. “Aluminum right now is my bread and butter,” Bally said. With one of his chairs currently on display at the Aluminum by Design, Jewelry to Jets, exhibit at the Carnegie Museum of Art in Pittsburgh, and another shown over the summer at the Sheen of Silver, Weight of Air exhibit at the Schneider Museum of Art, Southern Oregon, Bally believes aluminum is receiving the attention it deserves. He is also happy that the art world, and people in general, are receptive to his use of recycled materials. “That sends a good message to people—you don’t need new materials to make something.” Other recycled items that have become part of Bally’s art are bottle caps and wine corks. The Transit Chairs this year are resting on champagne corks in honor of the new millennium. The corks he receives in the mail from friends and strangers around the world, who have heard via the Internet that Bally needed them for his work. The signs, he assures his customers, are acquired legally. Bally is in constant contact with scrap yards and entities that may be disposing of signs in those scrap yards, such as transportation department workers. Lately, he has found competition for those signs, so Bally does not want to reveal too many details about how he acquires them. In fact, the signs-as-art phenomenon is so popular that Bally had to patent his Transit Chair design in 1996 to discourage imitators. Bally says he is pleased with the exposure his work, and that of other aluminum artists, is receiving at the Carnegie Museum exhibit. The exhibit is accompanied by a colorful book that tells the story of aluminum’s evolution. “With the book, I think it’s going to be a smash show,” he said. Although the Carnegie exhibit sponsor, Alcoa Foundation, would likely disagree, Bally believes aluminum has peaked and is on the verge of being replaced with materials, such as polymers and plastics. He sees the current attention to aluminum as a fond farewell to a useful metal. “Aluminum is going out with a huge round of applause,” Bally said. A rug of aluminum, jute, wool, and viscose was designed by Marianne Stengell to help find new, post-war uses for aluminum (1956). A fan with aluminum blades and folds of painted silk, designed by August Edouard Achille Luce (1866). Heller Hostessware produced Colorama tumblers, sherbet dishes and pitcher of anodyzed aluminum (1950). Robots in progress fill Clayton Bailey’s workshop. Clayton Bailey’s canine creation—a barking, biting dog. In Clayton Bailey’s hands, scrap aluminum is potential— potential arms, legs, eyes, or hands. Bailey, 61, of Porta Costa, California, is an artist whose fascination with mechanical toys has become a livelihood as he transforms aluminum leftovers into one-of-a-kind robots. One of his creations, a dome-headed robot with a built-in radio, was recently displayed in an exhibit of contemporary aluminum works at the Schneider Museum of Art, Southern Oregon University. A set of five others—an entire family complete with a barking dog—is listed in this year’s Neiman Marcus Christmas catalog as a “fantasy gift.” At $32,000, the set commands a respectable price for metal that probably was found in a junkyard. Almost all of Bailey’s robots have their beginning in an enormous scrapyard in Oakland, California. At one square block, the yard contains mountains of possibilities for Bailey’s workshop. Inside the scrapyard walls, he can survey piles of aluminum, auto transmissions and engines, lawn chairs, kitchen utensils, and more. Bailey makes the half-hour trip about twice a week, and also visits a flea market twice a week. He’s found roasting pans that were transformed into robot chests, and lava lamps that became digestive systems. Of all his finds, though, the ones he prefers are made of aluminum. “I’m a great aluminum enthusiast,” Bailey said. Bailey operates a metal shop out of his studio, where he installed a 20-ton metal press. He has made wooden dyes to stamp out shapes, such as for robot hands, and uses various tools to bend and shape the metal into features resembling the human anatomy. Aluminum tubing, three inches to 12 inches in diameter, is ideal for legs. Although he has been interested in robots and mechanical toys for years, for most of his life Bailey has focused his artistic energies on ceramics. Currently professor emeritus of ceramics at California State University, Hayward, California, he has taught ceramics at that college since 1968. Because he never knows what he will be working with, Bailey’s robots don’t usually grow from a well-planned design. Rather, they take shape as the shapes become available. Although he usually expects to follow the design of the human anatomy, Bailey’s finds have taken the form of birds, dogs, and other animals as well. “The found-object way of working is kind of interesting,” he said. And sometimes, controversial. One of Bailey’s prized robots is Marilyn Monrobot, a compilation of kitchenware, auto parts, coffee pots, baseball bats and cookware. (She is also corrosion resistant, fireproof and unbreakable, according to Bailey). Although he bills her as “the world’s most beautiful aluminum robot,” the anatomically-correct robot was on display at the Lawrence Hall of Science, University of California, Berkeley, when Bailey was asked to remove her. “Her breasts were too big,” Bailey said. No one ever taught him to make robots from rubbish, but Bailey’s ingenuity with metal probably is rooted in his father’s occupation as an autobody worker. “There seems to be a connection there,” Bailey said. Watching his father work, the young Bailey learned how to handle tools and metals. His imagination just took that knowledge in another direction. “I straighten out teapots, he straightened out fenders,” Bailey said. In addition, Bailey had an uncle who introduced him to the joys of salvaging scrap and the possibilities of electricity. The uncle served in the coast guard and would bring his nephew electronic parts that had been cast aside at work. Bailey learned about wiring and electricity by dissecting those parts and now puts that skill to use when wiring his robots. Many are more than shiny sculpture, they serve a purpose. The dog, for example, is wired with a motion detector to bark when it senses an intruder. Its master has a jukebox built in; another robot is a clock. As for his next robot, Bailey doesn’t know yet what its special attributes will be. That depends on what the scrapyard holds. "Illuminating Aluminum" is an article from the Pittsburgh Tribune-Review which provides another prospective on the "Aluminum By Design: Jewelry to Jets" exhibit. Maureen Byko is managing editor of JOM.